Ahh St. Lucia, The Helen of The West as it is referred to is an apt name for such a beautiful island. I dare you to find one person who has visited St.Lucia who wasn't in awe of its beauty. Writing this post kind of makes me want to be there right now. 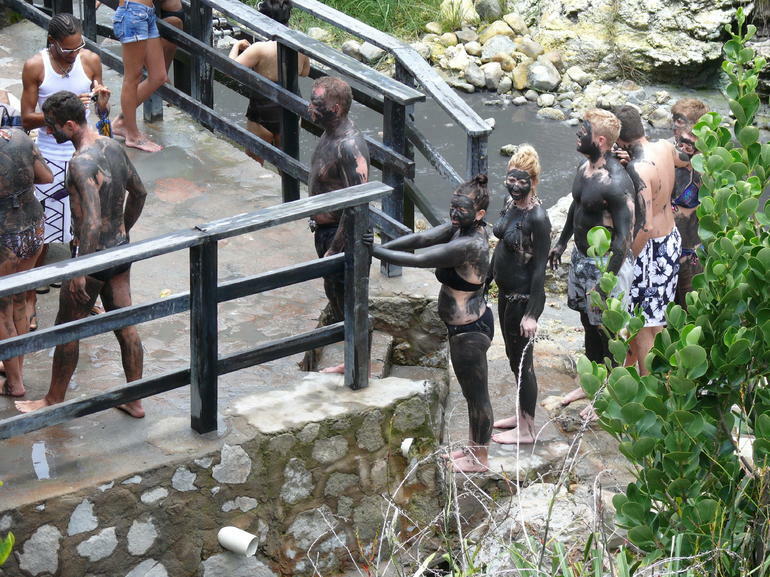 Numbers 1-3 below are all about the attractions in the super popular town of Soufriere. These lovely twin peaks are the island's landmark. And if you're up for the hike, tour guides can get you to the top. Just don't try it alone if a steep decline into the ocean isn't on your agenda. Spa day? What better way to enjoy a lovely spa day except the way that nature intended. These no additives, naturally occurring hot mineral bath pools are said to leave you looking and feeling younger. Referred to as the world's only "drive in volcano" the Soufriere volcano has been dormant since the 18th century. The crater is very wide and open which allows vehicles, mainly tour buses to drive through and get right in. Hence the phrase, "drive in volcano". Additionally, this volcano is the source of the sulphur spring pools mentioned in number 2 above. The beach at Pigeon Point is very popular with both visitors and locals alike. Pigeon point national Park in the background is an old fort and a favorite wedding venue. It has a rich history, great views (Martinique can easily be seen on the horizon depending on visibility) its own beach and less of a crowd for a small fee. By the way, great beaches can be found all over St. Lucia. Oh yes, fun loving friendly people always help make your visit more pleasant. Beautiful pictures. Makes me really wish I were able to travel more! That volcano looks amazing, wish I could see it!